TOTALLY UPDATED 2019!! fAB WATERFRONT! GREAT SUNSETS! HUGE LOT! A+ LOCATION!!! Newly renovated in 2017 to include new queen size bed in the master, hard wood floors on the main level, new carpet in bedrooms, fresh paint, all new mattresses, new bedding, and many more updates. Located on the SE side of Torch Lake between Alden and Clam RIver, this wonderful Torch Lake home offers two bathrooms, 2 main floor bedrooms one with a queen bed and one with 2 twin beds, remodeled upstairs dormitory bedroom with 3 double beds and one twin bed with trundel, and large living and dining rooms with knotty pine paneling. It also offers a sun room and Three Season sun porch. Outside is a large patio with new patio furniture and an open porch facing the lake. Spectacular views abound. A very deep lot with gradual slope to the water. Be sure to see the pictures! BRAND NEW DECK OVERLOOKING THE LAKE 2018!! Dock and mooring buoy for a boat. Moor at your own risk. Owner assumes no liability. Single woman, age 67, occupies entirely separate private residence towards the road. MY GRANDFATHER PURCHASED THE PROPERTY IN 1945. THE FAMILY WAS HERE WHEN THEY LEARNED THAT WORLD WAR 2 ENDED. THIS PROPERTY IS CLOSE TO CLAM RIVER (HOME OF THE POPULAR 'DOCKSIDE'), CLOSE TO THE QUAINT TOWN OF ALDEN VISITED BY HUNDREDS EVERY YEAR FOR ITS GREAT SHOPS AND EATERIES, AND A TEN MINUTE BOAT RIDE TO THE TORCH LAKE SANDBAR. THERE IS MOORING FOR A BOAT,AN UPDATED HOME WITH ALL THE AMENITIES, AND A VERY DEEP LOT. SPECTACULAR SUNSETS CAN BE ENJOYED AS YOU ENJOY GATHERING AROUND THE LAKESIDE FIREPIT. Flat screen high definition T.V. with premium channels. Fire pit at lake shore. Dock and mooring buoy for a boat. Great place with Great Lake access. Perfect for kids; upstairs dormer with their own space. We had a wonderful stay. Leslie made recent updates/improvements and every last one was perfect! We hope to return next year! My family and I just returned from an incredible vacation, 2 adults, 4 children. We thoroughly enjoyed ourselves and are thankful to the owner for sharing her home. We had room to spare. This property is located in an ideal area on Torch Lake the south east side with beautiful sunsets, a few miles from the quaint shops in Alden. The property itself was perfect for my family! All the amenities, plus a nice backyard with a dock on Torch Lake. This is the first review I have taken the time to write. I noticed the comments below, BUT had a very positive experience. The owner was completely professional AND we have friends that live and run a local business on Torch Lake, who also know the owner and have only compliments. I am not one to write reviews but I wanted to respond to one negative review I read when checking on the availabity of this place for the end of August. My party of 8 had a great time here last summer. The place was great and we were not at all disappointed! The owner was rarely there and never intruded on uor privacy. I woke up after the first night in the bed off the kitchen and had bedbug bites all over my body. The house is PACKED with furniture - so much so that it was difficult to move around through the house once you put the advertised limit of 10 people inside. If pleasant decor enhances your stay, find a different house. The walls, furniture, lighting, etc were downright obnoxious. Most disturbing was the owner. She spent the entire time we were there watching us from the upstairs window in the In-Law Quarters next door. CREEPY! She stared at us with an evil expression - not too inviting!! I was with a group of 30-50 year old women, and we spent the majority of our time on a boat on the lake. When we were at the house, we were relatively quiet, not loud or destructive. There was NO reason for her to monitor every moment of our vacation. DO NOT STAY HERE! 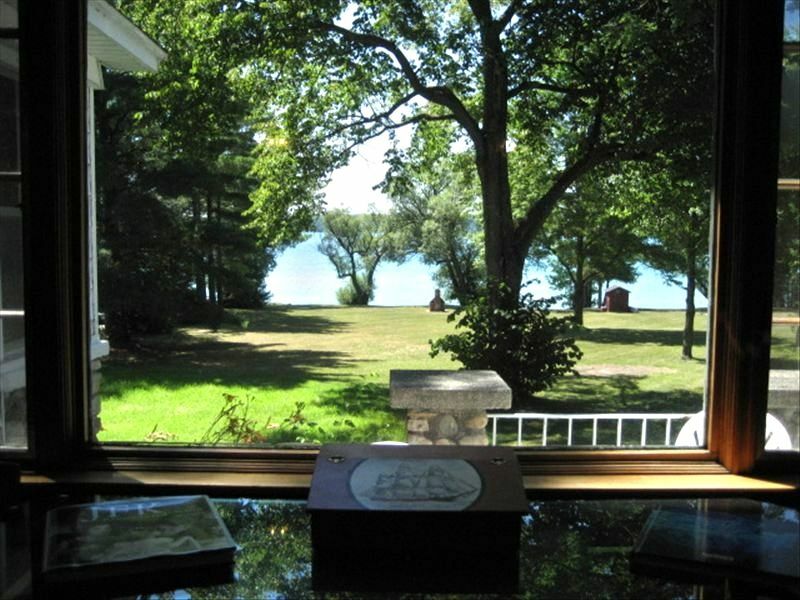 There are PLENTY of beautiful homes on Torch Lake with owners that are friendly. Don't waste your time or money with this one! I just found out about this review from another family who rented from me this past summer. I have been renting for the past 5 summers and it has been my experience that people don't take the time to write reviews so I don't check for them. I am grateful that this family took the time to refute this poor review and to let me know about it. During the 5 years that I have been on VRBO I have had many families that rent from me from year to year which would not happen if they weren't happy with their rental experience. I am fully booked every summer. I have many photos on the listing that families review before contacting me. They include interior photos so the decor can be seen in advance of booking. When I am contacted, I email additional photos showing every room. I have a very good cleaning crew who strive to offer guests an immaculate place to stay.All of the linens are new and there have NEVER been any bed bugs or other bugs. Many items in the cottage are new including all the kitchen appliances, all bathroom fixtures, well. septic, and drain field. All of the outside furniture is new including 10 lakeside chairs, 4 lakeside porch chairs and all of the patio furniture. The occupancy limit for the house is 10 people and the well and septic are designed for that accommodation. By the middle of the week during this guest's stay there were 9 cars parked here and remained here for the next 2 days. It was clear that the occupancy limit was greatly exceeded as per the rental agreement. Although I could have asked the party to leave, I did not.I did,however, retain a portion of the security deposit which is what prompted the negatve review as she was very angry that I did that. Never, at any time, did I stare or moniter anybody let alone with a creepy, evil demeanor. I wasn't there when the group arrived and wouldn't recognize anyone if I passed them on the street. I am a working realtor and am gone most of the time. All I can say is this is so untrue! Clearly there would be many negative reviews if this were true. don't want to live next door to rentals with no guidelines for the use of the property. That is why occupancy limits are so important. Many townships have debated banning rentals. It is crucial that owners who do rent, do so responsibly with the greatest respect for both neighbors and for the rental guests. While checking to make a reservation for the summer of 2013 at the cottage we rented in 2012, I noticed there were 2 reviews and decided to read them. I very much disagree with VERY DISAPPOINTED. My family of 10 (5 adults, 2 teenagers and 3 children) stayed there this past July and had a wonderful time. Yes, the house is an older lakeside home, but it is very clean and comfortable. We found it very quaint and nostalgic. We had all the essentials we needed. The owner lives in an apartment on the property but we never felt any invasion of our privacy and the ONE day that we saw her, she was very cordial and helpful.She gave us some good tips on restaurants and places to go. We loved our time at this Torch Lake property and that is why we are coming back again and again.